Rebekka Van Bockstal is a passionate Belgian guitarist and composer that draws inspiration from the tradition of jazz music, exploring the different ways the music can reflect the sounds, colors and energy of today, is the core principals of her sound. Rebekka’s compositions are inspired by the music of Pierre Van Dormael, Robin Verheyen, Low Lund, and Maria Schneider. In 2012, Bockstal started her training in performance at the jazz department of the Ghent Conservatory. In 2015, Bockstal continued her studies at the Royal Conservatory of Brussels, where she obtained her Masters in performing music (jazz) under the care of Peter Hertmans. In 2015, her band was recognized as a finalist of the ‘Concours XL Jazz’ competition at the Brussels Jazz Marathon. Starting in 2016, Bockstal’s main musical focus became her own quartet, RVB Quartet. 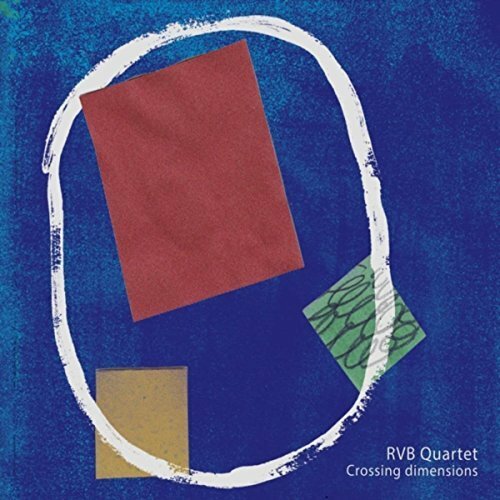 RVB Quartet released their debut CD entitled, Crossing Dimensions. The project has ten original compositions and the band is comprised of: Bocokstal – guitar, Ambroos De Schepper – saxophone, Kobe Boon – double bass and Marius Couvreur – drums. “Underground Habits” starts with a nice bass figure from Boon’s big woody bass. Bockstal and De Schepper play the melody of the shifting groove. The group has a vibe, they are relaxed and focused on projecting a musical story. Bockstal’s solo builds nicely, her sound has just a touch of distortion, but her lines and rhythm are all conveyed clearly. De Schepper’s solo is equally clear and full of meaning and energy. Each player gives ample space to improvise and space is given to the melodic leader as is the case with “Crossing Dimensions.” Starting with De Schepper’s saxophone bringing the band in, the composition evolves through wonderfully written contrapuntal sections, well-executed band hits and flowing time changes. Bockstal takes a more aggressive approach to the solo, adding more distortion and digging in with her right hand-picking attack, she delivers an energetic and musical statement. The writing of the solo is excellent, Bockstal’s compositional skills are the highlight here. De Schepper’s solo is building and Couvreur’s drumming on this track is epic. Boon’s bow work offers a creative flair, to compliment the ensemble sound. Crossing Dimensions is a fine representation of the state of modern jazz, it has movement with various styles and rhythmic settings and flows, the musical language draws on the heritage of jazz while still bringing in multiple forms, melodic structure and sounds from other genres. Be the first to comment on "RVB Quartet | Crossing Dimensions"